Foosball Rules - Learning This is Crucial to Play This Lovely Game! The playing of any game has rules. Today you will get more familiar with Foosball Rules. It is very important to know the rules of any game you wish to play, as you will be able to maintain strong control and be able to enjoy the game with your opponents. Playing foosball like any other game has its rules. For persons who are foosball enthusiasts, they will educate themselves on all foosball rules and will certainly adhere to them; however, during friendly play, there are rules which are enforced generally and some that are enforced during a competition, which basically means ALL the time! Looking for the best foosball table? Check our homepage! This rule begins all foosball games. It determines who gets to control the ball for the first play. The winner of the coin flip decides which side of the table their team will play. The sides for choice are set during the full course of the game. After the first round and a goal is scored, the team who the ball was scored on, gets to start the next round of play. This enables teams to have a fair advantage during the game and keeps the game flowing smoothly. Spinning is a no-no during the playing of foosball. Spinning is having the rod rotate more than 360 degrees before play or after play when the ball has come into contact with a playing man. The foosball ball must be allowed to stay in play without having any unnatural influence on the general flow of the game. This is because it takes away from the skills of playing and the challenge which it needs during a game. The only way of eliminating spinning is to ensure your hand is always on the handle. If the unforeseeable happens, then, you give up your right to the ball, which gives your opponent an advantage, as he will use this penalty with his 5-man rod. Jarring is another of the rules in foosball which is a no-no. Jarring occurs when a player uses trickery to influence the direction the ball goes. He will make an aggressive play which results in the table lifting or tilting, or he may deliberately hit the bumper which causes the table or rods to shift in a manner which causes the foosball ball to change playing the course. A penalty for this as a first offence is to reposition the ball where it would have been if this illegal play had not occurred, or the ball to go to your opponent who will also use it with his 5-man rod. The second offence is a lot more severe, as your opponent will be able to play this penalty from his 3-man rod, which is a great advantage. With any distractions there are penalties. For the first distraction charge, the team will be given a warning, as deemed appropriate by the game official. (Officials may be appointed in home games if you so desire, to make playing more fun and structured) For a distraction which causes a goal to be scored, the goal will not be counted. Basic penalties for distraction will give the opposing team the advantage of play, and they have the option to continue the game from the point of the distraction infraction. This is a very serious rule, I believe. Firstly, it is a good practice especially if you have children around, as this is a family game. The penalties for foul language are; your opponent will get control of the game from his 3-man rod for a penalty shot. Continuing of this awful practice will result in a game lost or match lost. A dead ball is classified by the ball, not in play and is out of reach of any teams playing men. When this occurs the ball is returned to the team who served at their 5-man rod. If the ball is a dead ball at the position between the goal and the 5-man rod; the ball is repositioned at the 2-man rod nearest the spot it went into a dead ball zone. The game is restarted by the call of the “official” word…”Ready! There are times when the ball is made intentionally dead during play by players and this will result in the control of play being given to the opposing team. No matter what is done to affect a dead ball there are penalties, to ensure the game is played fairly so as to not lose your advantage. A ball becomes out of play when it shoots above the table and hits the top rail. This is corrected by the ball being awarded to the team who was last scored on for a continuation of the game. In International tournaments, there are many other rules which are in effect. The Officials are challenged to be very aware of these infractions and are able to make rulings against teams if they are not adhered to. 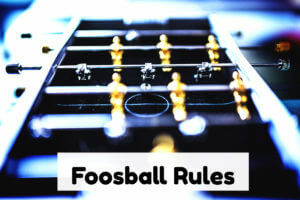 Foosball Rules are a set and constant guidelines for any official match. Having a home game or a game among friends with Basic Foosball Rules are OK; however, if you choose to use an official during these games to make it more fun and challenging, then you may. Remember, playing the game is fun and once you adhere to the basic rules you are good to go.